One of the most awaited judgment in known history, the verdict of Ram Janmbhoomi-Babri Masjid civil suit, has finally arrived. The fact that this dispute has evoked unprecedented frenzy and passion in the past, it was expected that no judgment can completely satisfy any of the sides. But the judges seem to have gone the extra-mile in trying to settle the case and also come up with a workable formula where no side gets absolutely heartbroken or feeling that there not an iota of justice with them. Initial understanding of the summary of the verdict delivered by the three judges bench, suggests an attempt to diffuse the dispute that has caused communal discord between the two major religious communities, riots and thousands of deaths. The site has to be divided equally among the three parties. The idol of Lord Rama will remain where it was installed. The remaining 2/3rd will be divided between Nirmohi Akhada and the Sunni Waqf Board. The judges in unison opined that the idols will remain where they exist. The petitioners may not have asked for a compromise or a sharing formula, but the court decided that Hindus and Muslims have prayed side by side at the complex in the past, it can happen again in future as well. So Muslims can have mosque at the remaining 1/3rd. In the past, courts in this case and other similar cases have given judgments that were termed one-sided. Presently, even if the judges have gone ahead and tried to sort out this dispute, this is quite understandable though Justice Sharma disagreed with Justice SU Khan and Justice Sudhir Agarwal. Perhaps, Sunni Waqf Board may still decide to appeal against the verdict. Everybody is entitled to his opinion but personally I feel that the Muslim leaders should gracefully accept it, and put an end to this conflict, which will also bring harmony. The majority judgment appears to have decided in favour of Hindus and Muslims praying together, which is the halmark of the composite culture, the ganga-jamuni tehzib, for which citizens of Oudh used to take pride. Hashim Ansari, 90, says he welcomes the judgment. After all, Ayodhya or Ajodhya [Ajudhya] literally means a place of no war. So there should not be any bloodshed or conflict over the issue in future. One hopes, that the issue is over. At least, with regard to its potential in terms of communal polarisation and dividing society. 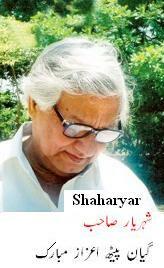 True to his name, poet Shaharyar* rules over the Urdu literary landscape in the sub-continent, particularly, India. Kunwar Akhlaq Khan 'Shaharyar' was born in Aonla [Anwla] town in Uttar Pradesh's Bareilly district. He published a monthly magazine, Ghalib, in 1959. While many of his generation spent themselves early and faded from the scene, Shaharyar remains as prolific as he was three decades ago. He is loved by masses as well as classes. His ghazals like 'dil cheez kya hai aap meri jaan lijiye' and other verses that were used as lyrics in Bollywood movies including Umrao Jaan and Gaman further added to his popularity. As a result his ghazal spread across non-Hindustani speaking regions. He has won many prestigious awards including the Sahitya Akademi and the recently announced Jnanpith Award. For reading these couplets in Urdu script and Hindi. Click here. For reading Shaharyar's other Ghazals and Nazms in Urdu, Roman English and Hindi scripts at my other blog, Best Ghazals, on the link here. UPDATE: Shaharyar passed away on February 13, 2012. He was suffering from lung cancer and died after brief illness at his residence in Aligarh. The news of his death has saddened poetry lovers, the literary community and those who loved the poet. Shaharyar was 76. Owing to popularity of his lyrics for movies like Umrao Jan and Gaman, his fame had spread outside literary world also. *Shaharyar means king or one who has suzerainty. A man said that his pet dog had become untouchable after it was fed roti by a Dalit [lower caste] family in the neighbourhood. Worse, the man abandoned the dog and threatened the Dalit family, asking them to pay compensation for spoiling the dog. This is another example of the horrible caste practices and prejudices that are prevalent in Chambal region of Madhya Pradesh. The case got attention due to the recently initiated public hearing scheme in which citizens can meet top officials on a week day and make direct complaints to them. The incident occurred in Malikpur in Morena district. The Dalit family was fearful to live in the area. The neighbour was forcing them to either pay him Rs 15,000 for the loss of his 'well-bred' dog who had been corrupted or face consequences. Even the Panchayat members supported the oppressor. Incidentally, in this case also the accused doesn't belong to the Upper Castes, rather he is a member of a dominant backward caste. Moneyed and land owning OBCs are harassing Dalits and Tribals in many parts of the country. The District Magistrate and the DIG also appeared shocked by the incident. The officials concerned have been asked to take action and provide security to the family of the victim Chandan Jatav. Chandan's wife Sunita insists that she was returning from fields and had an extra 'roti' which she gave to the dog but the neighbour was aghast, threatening her to face the consequences for the act. In fact, discriminations due to caste and economic status don't get adequate attention in media. In my last post regarding Shobhaa De's article on denial of admission to Muslim youths in colleges, I had mentioned that discriminations are all around and not limited to any particular community alone. How would a family feel when they are told that even the dog gets untouchable if they touch or feed him? It's horrible. It shows how poor communities in rural and semi-urban India continue to face segregation and humiliation. Perhaps, it was because of the public hearing scheme that the news came out and reached officials, else such complaints are not even registered at the police station level, where complainants are simply turned away. It's unbelievable but true. There exists a mosque where the idol of Hindu god is kept once every year for a period of ten days with no communal disturbance ever in the last three decades. Right now all eyes are focused on Ayodhya, ahead of the verdict over the Ram Temple-Babri Masjid controversy. 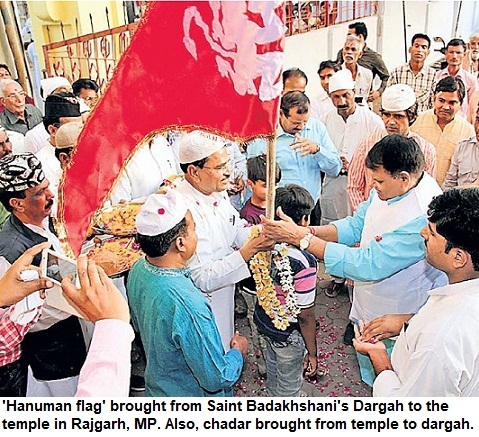 But, on the other hand we have such shining examples of communal harmony, as reported by journalist Chandan Haygunde. He writes about Gotkhindi town in Maharashtra's Sangli district gives an indication about the unique diversity of the country as also the fact that how far the common man can go in terms of being liberal and accomodating for others. By any standards the Muslims of Gotkhindi have gone out of the way in search of coexistence and amity. The twon has a population of 12,000 and just 2.5% population is Muslim. The tradition began over three decades back when rains suddenly came and the idol of Lord Ganesha were kept in open. It was suggested to keep the idols in the mosque for the period. Even though it goes against the monatheistic beliefs, Muslims obliged and the practice continues to this day. Haygunde must be congratulated for the brilliant report, 'At Peace' published in Indian Express. The story can be interpreted in many ways but it is just once story. There are tens of thousands of stories of harmony by Hindus and Muslims [& other communities], unbelievable gestures that have not been told or properly publicised. The ownership rights of the land on which Babri Masjid once stood, rests with the Sunni Waqf Board but the case is in the court and the verdict is expected on September 24. The leaders of Rashtriya Swayamsevak Sangh [RSS] seem delighted as they have sensed another opportunity for a conflict with Hindus and Muslims. Whatever RSS chief Mohan Bhagwat said at a press conference organised by Women's Press Club in Delhi recently, can only be termed disgraceful in any civilised society. Bhagwat said that Indian Muslims should give proof of their patriotism. He claims that the minority can't be trusted and the community should come forward and send a message that it doesn't have loyalty outside the borders of the country. In one stroke, Bhagwat abused the entire Indian Muslim populace who are citizens of this nation. Bhagwat needs to be asked about his locus standi before expressing such views. After all, when the founding fathers of RSS, Hedgewar and Golwalkar, were busy in sycophancy of the British maters, the rest of Indians including the Muslims were standing together and giving sacrifices for independence. In 1920, when the entire nation was standing with Gandhi and the imperialists were losing never against the tsunami of pro-independence emotion, British government accepted the apology of VD Savarkar who was in jail then and released him on the condition that he would form an organisation that will divide Hindus and Muslims. Any student of history will tell that soon after his release Sawarkar wrote his book 'Hindutva'. On the basis of the book and the narrow Hindutva ideology espoused by him, RSS was formed by a 'doctor' in 1925. Later Hedgewar scripted his scheme for causing discord between Hindus and Muslims, which gave relief to British as communalism spread its tentacles. For 27 years, nationalist movement remained at its peak but not a single RSS leader was jailed though tens of thousands of Indians were incarcerated in this period. While it kept a distance from freedom movement, RSS leaders' names came up during the course of investigation in the assassination of Mahatma Gandhi. ...On September 24, the verdict in the Ram Janmabhumi Temple-Babri mosque case is expected and the onus is on secular parties to ensure that communal forces are not allowed to further their agenda. While addressing journalists in Delhi, Sangh chief said that the RSS would not do anything that would go against law. However, in the very next sentence he said, 'after the judgment the Sant Samaj would decide the next course of action'. Everyone is aware that VHP had formed the Dharma Sansad in the earlier 90s and it comprised Sadhus close to Sangh Parivar. In this game, VHP was the nodal agency and mobilised fundamental forces. Bhagwat's statement suggests that on this occasion VHP will be kept behind and the Babas would be given charge. On the last occasion, VHP had collected huge funds and the lure of money can attract some groups of Sadhus to fall in RSS line. Secular leadership remains passive while Muslims have no fresh leadership. The police alone may not be able to hold fundamentalist forces in check. In this scenerio, Mayawati should also ensure that BSP workers get to the streets. If lakhs of party activists go out to ensure calm, the timid fundamentalists would not be visible anywhere. Mayawati has a historic opportunity to win the trust of all the secular minded Indians. If she is able to check attempts to fan communal hatred and ensure that Uttar Pradesh remains riot-free, she will gain respect of the society. The RSS leaders have aspirations to be recoginised as leaders of all Hindus. But they can only be leaders of Hindutva-wadis, as just 3% Indians are members of either the RSS or BJP. The rest are peace loving citizens who stand against communal and divisive forces and consider Muslims as their brothers. Noted journalist and columnist Shobaa De recently found how several colleges in Mumbai were not giving admission to meritorious Muslim students though they fulfill all criteria. The article that was published on TOI's editorial page shows her concern and the anguish she felt at the blatant discrimination that was being practiced in certain high-profile educational institutions. Communal, casteist and racist discriminatory practices are nothing new. On one hand we will find individuals who will go extra-mile to help the 'other' or the 'marginalised' and on the other hand there are individuals who act in a xenophobic manner. The issue of denial of flats or houses to Muslims has been discussed many a times. But all these issues can be deal with when we have a vigilant society where individuals and groups fight for the rights of themselves and others. It is not just about Muslims, but also about the Tribals, the Dalits, the economically weaker upper castes. It is about taking up cudgels whenever you see or smell corrupt practices and wrongdoings. The poor get cheated everywhere--from the ration shop where they don't get the allocated share of grains to the hospitals where doctors aren't available or medicines not provided to them. Society ignores this discrimination. Leading colleges and schools routinely charge funds and give admission on the basis of contacts and cash, ignoring merit. Seats are bought almost everywhere. The point is that wherever there is injustice, it must be fought with and we should side with the victim. The other day a group of neighbourhood women were ruing how the domestic helps [bai or kaam-wali] have formed a union and want a weekly off. How can 'they'? Here 'they' was uttered in such a tone as if these women who are forced to work in others' house due to their poor financial condition aren't human at all. For a few hundreds the women work in households and a large number of 'educated' middle-class considers them as if they are sub-human. They are denied leaves and often salary is cut for absent days even though the household head enjoys all sorts of leaves at his/her office.Isn't it ironic as women discriminate against the maids and exploit their 'own' tribe[females]? This is just another example, as there are umpteen forms of discrimination. Even giving favour to one candidate belonging to a community or linguistic group is a discrimination against another candidate. De's article is welcome and we must all see there is justice for all sections. We are armed with RTI [Right to Information Act] and media revolution. So it's important to be vigilant. De's concern is legitimate and laudable. There is a lot of hypocrisy in our society and the personal biases of some persons lead to such illegal and unjust actions. However, she should have named these 'reputed colleges' and their 'principals' so that they could be shamed for their mindsets. There is impact when institutions are named as their prestige gets affected. Once the names are published, there is media gaze and more scrutiny the next time. There is also more onus on the institutes to come clean. Salman Khan has turned the tables once again. His latest movie, Dabangg, is all set to be one of the biggest ever hits in Bollywood history. Not just Salman fans but even film-buffs who never had a special liking for the macho star, seem enchanted by the film. Dabangg is quitessential Bollywood masala movie packed with action, emotion and some romance. So what sets it apart from other films? For me, the foremost positive point of the movie is that the poor man is again back in the big-budget movies. Who would have imagined that a woman selling earthen pots could be the heroine in a movie anymore? Sonakshi Sinha who plays the female lead role opposite Salman Khan, sells 'surahis' and her father is an alcoholic who is to be dragged back home often from the street or railway track. It's not Circa 1975 and it's several generations since Sholay, still, it works. Fed up with NRI or homegrown millionaires of the likes of the 'sophisticated' Raj Malhotras whose filthy rich ladylove would only travel in swanky cars, it's a surprising and welcome relief. Further, the story is based not in a metropolitan city rather in a small town. Pandey is shown working for Lalganj police station and it appears to be a small town in the midst of rural Indian heartland. Pandey has a strained relationship with his stepfather and stepbrother. He becomes a policeman, a crook cop, who can eliminate anyone by staging a fake encounter, and has no qualms in taking bribe, of course, from big criminals. After all, he has to survive in the system where corrupt politicians have nexus with the outlaws. Still, this 'crazy' supercop has certain principles and he will go to any lenghts to ensure that the poor gets justice. For the last year or so, Indian audience was waxing eloquent about evolving Bollywood movies that may not necessarily have the song-and-dance scenes. 'Intelligent cinema' was the buzzword. But here is another movie that doesn't require audience to think much. The film has incredible stunts, the item song 'Munni badnaam hui' and some crude jokes have been thrown in to keep us hooked for almost two hours. However, despite being a 'formula film', it somehow gels this time. After the debacle of the much-hyped Veer, Salman badly needed a hit and Dabangg appears to be a mega blockbuster. While Amir Khan may be the cerebal actor and Shahrukh Khan seen as the star catering to the classes, it is the 'bad boy' Salman--who seems to connect with the masses. Either it's multiplex or theaters in small towns, the movie is getting packed houses everywhere and it's a testimony to his charisma. The dialogues, particularly, the punchlines for Salman and his swagger, are a hit with his fans. After this movie, we will see lot of youths tucking their sunglasses behind their collar, just like the cop Chulbul Pandey does it. With record earning of around Rs 50 crore [500 million] in the opening weekend at the box office, once again Sallu has proved his critics wrong. Perhaps, along side Peeple Live, movie-goers also need movies like Dabangg that are just meant to entertain. Movies where the hero plays the superman and gets cheered by the crowd until it's happy ending. Dabangg is certainly one such movie and it is not at all necessary to judge all movies as per the Western definition of cinema. We enjoy it, we give a thumbs up. That's all. Nitish Kumar Vs Lalu Yadav: Who will win Bihar Assembly election? The Election commission has sounded the bugle for Assembly elections and for the next two months, all eyes will be on Bihar as one of the most interesting political battles will be fought in the state. Nitish Kumar had led the JDU-BJP coalition to victory in the last election, ending the RJD 'misrule' during which Bihar had become a synonym for backwardness, especially in later years when Lalu Prasad Yadav had anointed his wife Rabri Devi as Chief Minister. Nitish had fought on the plank of development and the electorate's anger against Lalu Yadav had helped him win the election. Five years after his victory, the image of Bihar as a lawless state seems to be changing. The Naxalites' abduction of four policemen early this week and the killing of one of them, indicated the helplessness of the adminstration and that all is still not well in the State where 31 out of 38 districts are Maoist-infested. 1. But Bihar appears better than it was five years ago under RJD rule. Abductions for ransom, particularly, kidnappings of children and robberies had become the norm then. Bureaucracy was riddled with corruption and become ineffecitve while the politician-criminal nexus was thriving. Today, there are roads in Bihar. The law-and-order has improved. And the bureaucracy is no longer invisible, it works to an extent. Lalu Yadav had perhaps thought that the caste configuration alone would keep his party in power. However, his arrogance did him in. He failed to see the writing in the wal. In every election, Nitish Kumar's vote share had been going up, and with Congress failing to provide an alternative, the Upper Castes and the angry voter rallied behind Nitish. 2. During Nitish's tenure, communal forces have been kept in check. Lalu Yadav used to claim that he kept Bihar riot-free but Nitish has also matched the record. And despite the fact that BJP is a partner in the government, JDU has not allowed the party to enforce its agenda. The BJP also appears not in a mood to annoy Nitish and is happy playing second fiddle. In a way, Nitish Kumar has balanced it well. He gave land for AMU campus in Kishanganj despite ABVP's movement and the BJP's visible discomfort. He made public his reservations regarding Narendra Modi's firebrand Hindutva and took on BJP on this issue. It was seen as an attempt to woo Muslims. For 15-years, it was the Muslim-Yadav [MY] vote boosted by section of backwards and Dalits, that kept RJD in power. 3. The upcoming elections are not going to be a cakewalk for JD(U). After all, Lalu Yadav's RJD and Ram Vilas Paswan's Lok Janshakti Party (LJP) who had fought against each other in the last election, are now united against the JDU-BJP alliance. With a strong Dalit backing, Paswan's LJP can swing the vote in favour of Lalu Yadav. Nitish has, however, left no stone unturned. Unlike Lalu Yadav and Paswan, who represent communities that have numerical strength, Nitish belongs to Kurmi caste that barely forms 3% of the electorate in Bihar. He has thus played the 'Mahadalit' card to divide the Dalits. Identifying the Extemely Backward (EBC) and the Pasmanda Muslims or the Dalit Muslims, Nitish has tried to divide the core votebank of his rivals. JDU expects that a section of Muslims, who comprise nearly 17% of voters in Bihar, will support it and this split will help Nitish Kumar. 4. Though Muslims have generally not voted en masse for any party that has a truck with BJP, there are indications that JDU will get a chunk of Muslim vote. Nitish Kumar expects that the upper caste would largely vote for him. But Congress may play spoiler, as it is contesting the election on its own. A section among upper castes, particularly, the Brahmins, Bhumihars and Rajputs [Thakurs] have been upset with their declining fortunes in Bihar where backward caste leadership emerged post-Mandal era. In fact, for several decades after independence, upper caste leaders dominated the politics of Bihar. However, the Mandal-genie propelled backward class leaders in North India and Lalu Yadav, who had stopped LK Advani's rath yatra by arresting him in Bihar, became a champion of minorities as well. For fifteen years, Lalu Yadav remained at the helm and when he got involved in fodder scam, he ruled by proxy as his wife became the chief minister. Feeling marginalised, the Upper Castes now seem to be moving towards the Congress. If the Congress manages to get away with Upper Caste vote, Nitish Kumar's calculations can go wrong. Rahul Gandhi's election campaigan can make a dent in his vote. Over the next couple of months, Nitish will ask for vote by reminding Biharis about the 'jungle raj' in the state before he took over. 5. Meanwhile, Lalu Yadav and Ram Vilas Paswan will also put everything at stake. After all, it is going to be a battle for their policial survival also. The battle for Patna is not going to be easy. It's going to be a three corner contest: BJP-JDU Vs RJD-LJP Vs Congress. For Congress, Bihar remains a key state as far future of the party is concerned. Unless it does well in Uttar Pradesh (UP) and Bihar, Congress can't hope to form a government on its own at the Centre. Since 1989, Congress has been relegated as a marginal player in both states. Lately, Congress is seen making a comeback in UP where Mayawati's BSP and Malayam Singh Yadav's SP are the main players. Now Rahul Gandhi wants Bihar unit of the party to fight the election on its own and regain the lost turf. Bihar is the third most populous state in the country after UP and Maharashtra. 6. As far as BJP is concerned, it's been losing its voteshare in the state. The anti-immigrant stand of its other ally Shiv Sena to match the anti-Bihari sentiment of MNS in Maharashtra, has hit the image of BJP in Bihar. The party is more than happy to let Nitish Kumar play the role of big brother. In some regions, communists and independents can turn it into a multi-cornered contest. The polls will be held in six phases and the verdict will be out by November-end. Till then, we can speculate and enjoy the spectacle.